altimore Catechism 1. Since its 1885 debut, the Catechism commissioned by the Third Council of Bishops in Baltimore has instructed generations of Catholic faithful. 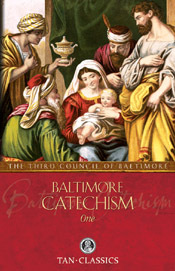 The 33 lessons contained in Baltimore Catechism No. 1 present the basics of the Catholic Faith in a manner suitable for First Communicants through fifth graders.